The most luxurious professional Spa. A truly distinctive piece designed for establishments and complexes serving the most select and demanding customers. 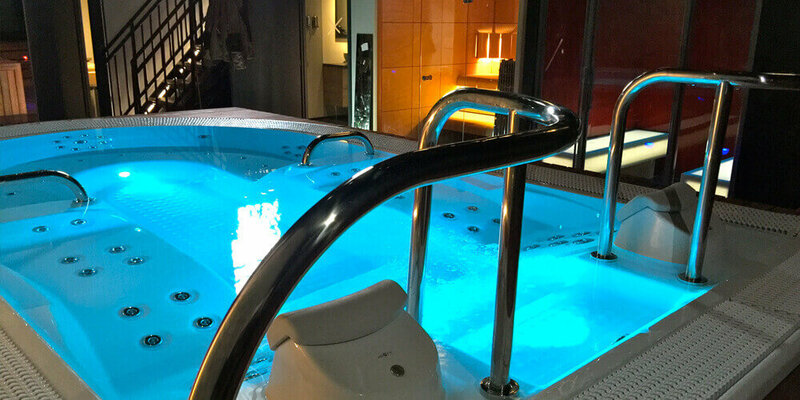 The Hydrotherapy Spa (Izaro) is the most complete and exclusive Spa in the Aquavia Spa commercial and professional range, a truly distinctive piece designed for establishments and complexes serving the most select and demanding customers. With its state-of-the-art “Made in Barcelona” design with 7 positions, it is the largest Spa with full comfort and convenience. It has two comfortable and spacious loungers with an excellent distribution of jets and nozzles that provide a complete massage from the upper back to the calves, and even down to the soles of the feet. The other positions each have a different arrangement of massage features and a semi-circular seating arrangement without separations between them to make it easier to move around. 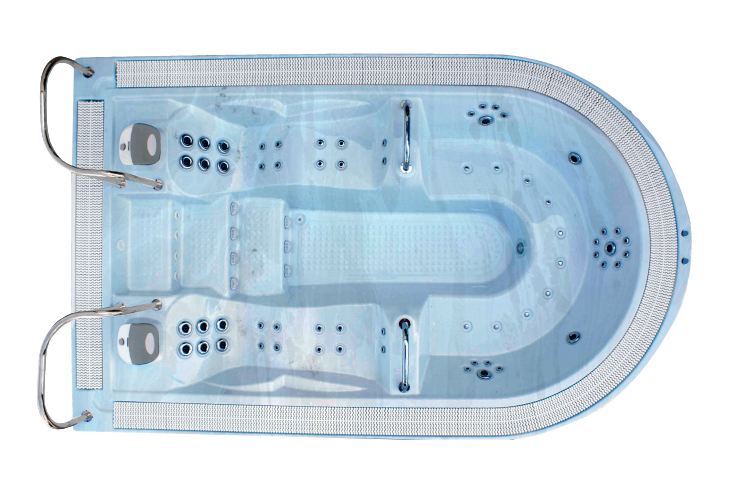 A total of 53 hydrotherapy jets and 10 air nozzles with the relax impact system from Aquavia Spa, all in a beautiful stainless finish, provide a very complete hydromassage circuit specifically designed to meet the demands of athletes who may require extra relaxation or muscle stress relief or even a lipo active massage. It also has two underwater LED spotlights for chromotherapy, creating an invasion of colour around the perimeter and overflowing into the interior to transform the moment. Like all of the hot tubs in the Aquavia Spa professional and commercial range, it is an overflow hydromassage tub equipped with a surge tank to ensure the water is always at maximum level regardless of how many people are in it. The standard overflow drain features an impeccable grille designed by Aquavia, but it can be replaced with natural materials like stone or wood. 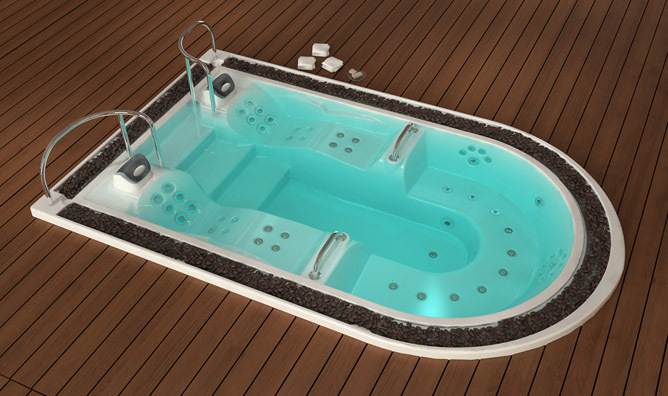 The Izaro is an exclusive hot tub that recalls the deck of a yacht. In fact, people have chosen to install it on the decks of luxury vessels, though it is also commonly selected to be a distinctive and top-of-the-line element in sports facilities like gyms, swimming pools or private sports complexes, among many other public establishments. It comes with stainless steel structures, bars and grips that make it easy to get in and out and move around its interior, with good ergonomics and mobility. Apart from its aesthetics, it comes with state-of-the-art equipment developed and manufactured by Aquavia Spa. It is both powerful and reliable, with a highly-efficient water heater, dual hydromassage pump and separate air injection and filtration pumps, all supplied separately to be installed externally together with the corresponding control cabinet. Technology and design come together in perfect harmony with the Spa Izaro. Select the perfect Spa to suit you.